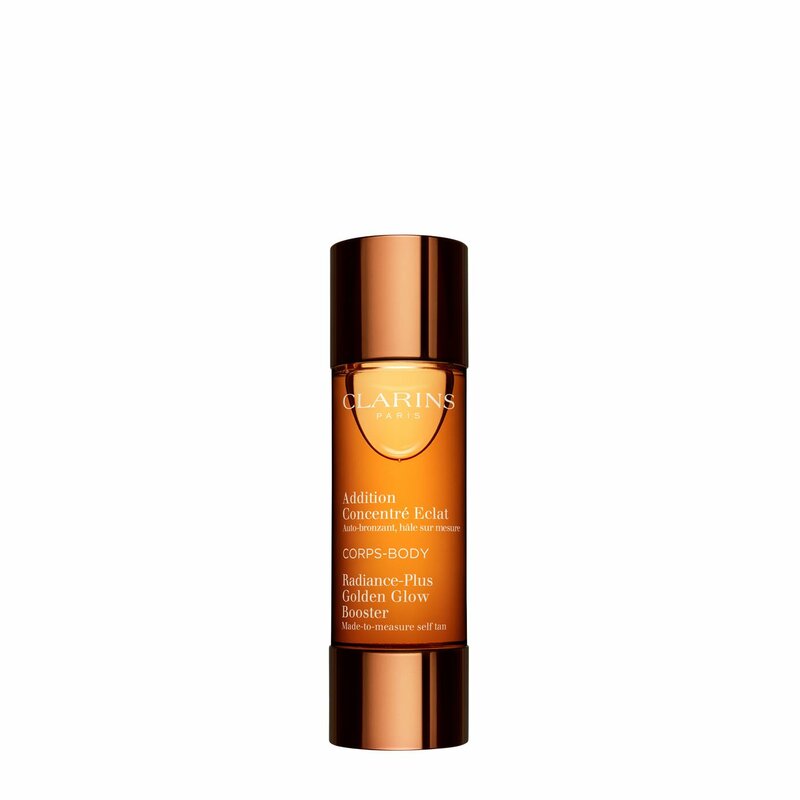 Combine with any Clarins body moisturizer to create a glowing, natural-looking self tan that builds gradually, evenly, from the first application. * Adjustable formula lets you determine the tan—from sun-touched, to très bronzé—while experiencing all the skin care benefits of your body treatments: firming, toning, contouring or slimming. Exclusive formula is 99.8% natural. *Must be mixed with body moisturizer; never use alone. Rated 5 out of 5 by Rsmudin from Red Hair Fair I was so tired of looking orange from other self tanners. I add a little extra lotion without tanner to knees and feet and I do not have orange feet or knees. I add about 4 to 6 drops per limb. I use the Clarins lotion they work wonderful together. Wash your hands after applying!! I honestly think you could use the tanner with any lotion and your going to come out sun kissed!! I will never use another tanner the results are beautiful and you can always use a drop or two more to get darker results!! Love this product!! Rated 3 out of 5 by MickieB from I am waiting for it to work! I'm on the fence about telling others, I was so excited when I found this because when you self tan there is always the dilemma about whether or not to use moisturizer everyday because it sometimes cancels out the last application.I have used 6 drops mixed w/my firming body cream and for 8 days in a row, no tan at all, the only areas were my big tow and around the ankle bone and a spot on each knee (for some reason no amount of exfoliating and scrubbing those areas ever gets rid of those semi-rough spots and I always put a thick cream over those areas so they don't absorb too much but it still doesn't help) I have no idea of what to do, I can't keep it if it is not working, the cost is not affordable if you can't use it! Rated 5 out of 5 by Lizz47 from Amazing!!! This gives your skin a wonderful golden glow. Not fake looking at all and best of all, no streaking. Very easy to apply. I have already told many friends about it and they have purchased it and love it too! Cost is reasonable. Rated 5 out of 5 by MLR52 from I love this self-tanner!! This is by far the best self-tanner I have ever used. 6 drops with my favorite body lotion and I get the natural looking color I want. This product is great around your feet, ankles and knees... areas that tend to absorb more product. My feet do not have the tell tell lines of a self tanner!!! That's very important to me!!! I would recommend this product to anyone who prefers to self-tan!!! Rated 5 out of 5 by lavenetianblonde from Best self tanner I have ever used I started my first bottle about a year ago - I used it heavily over the summer, less during the winter, but I still have about of a quarter of the bottle left. It doesn't seem like much, but it lasts! As a fair skinned redhead with sensitive skin, I have searched high and low for a reliable self tanner, this is by far my favorite and I see no reason to try any others. I really like how adaptable it is - when starting out, you can use a lot to get an intense color quickly, then use less to maintain. Issues with other self tanners I have NOT found with this one - splotches, smears, weird small dark spots, eneven fading, etc. Overall, this is very user-friendly, natural looking, and actually a pretty good value. One thing - I do try to be mindful of the lotion I mix this with. I try to use this mixed with the Jergens body BB cream, with the reasoning that it already contains a little DHA, so it won't have any ingredients that inhibit it. I am concerned that some lotions (such as those with oils, which normally I like) might interfere with the effectiveness of the DHA. Maybe this is superstition, but I have had good results this way. Overall, this costs a lot - but less than the 12 bottles of miscellanious self tanners on my shelf that I haven't used in a year, as they don't work as well as this. Rated 5 out of 5 by Georgia from Natural, versatile. I love these drops. I can use a little or a lot. I no longer have to forgo my regular skin care to self tan, so no more "crocodile self tan skin", which is often the effect with self tanners. NO self tan smell, NO orange overdose. I can't say enough GOOD stuff about this product and I have to admit, I was skeptical before trying it. You DO have to be consistent in using it if you want to keep your color, since it mixes into any skin lotion, that's EASY! I use this on my face too, don't bother getting the small "face formula" bottle of drops, this works just as well. Rated 3 out of 5 by rekamtah from Be careful if you have sensitive skin This product is strong, so it's important to follow the directions and apply it with a liberal amount of body lotion.